July 21 — Donald J. Trump has wielded his Twitter account like a weapon during his presidential bid to attack his rivals. But while Trump is a force on Twitter and other social media, Hillary Clinton has built a more methodical digital strategy heading into the general election season that could pay bigger dividends in November, experts say. The Republican presidential nominee has 10 million Twitter followers. Clinton, the presumptive Democratic presidential nominee, has just 7.5 million. Trump's army of 9.5 million Facebook followers is nearly double Clinton's 4.5 million. From May 11 to 31, 2016, 240 Trump tweets were retweeted almost 6,000 times. Clinton tweeted almost as often, 228 times, but was retweeted only about a quarter as much, according to a Pew Research Center report. But such statistics don't mean Trump is winning the social media arms race. “I don’t think that simply the number of followers and likes and retweets tells the complete story or shows the complete picture," said Benjamin Epstein, political communication professor at DePaul University. Clinton seems to be more focused on getting young people excited about her campaign, said Nikki Usher, professor of public affairs at George Washington University, whereas Trump is using it to drum up media attention. About 80 percent of links Trump posted on Facebook were news articles and 80 percent of his retweets were from the general public. By contrast, 80 percent of Clinton’s Facebook links channeled back to original content on her website, according to the Pew report. Clinton posted about five times more video than Trump on social media, though, according to the study, and more of it was original ads. Although Clinton has fewer followers, she boasts a stronger social media reach than Trump and may use this to recruit volunteers, voters and donors, Epstein said. He pointed to sites such as Klout Inc. and PeopleBrowsr's Kred, which use algorithms to simultaneously track multiple social media sites, including Instagram and LinkedIn, and approximate an individual’s broader online reach by how messages are amplified and shared amongst the most influential users. 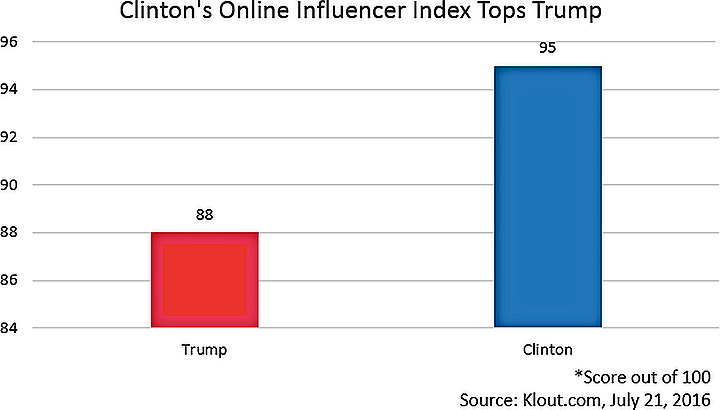 Clinton’s daily Klout score for July 21 was 95 out of 100, compared to Trump’s score of 88. 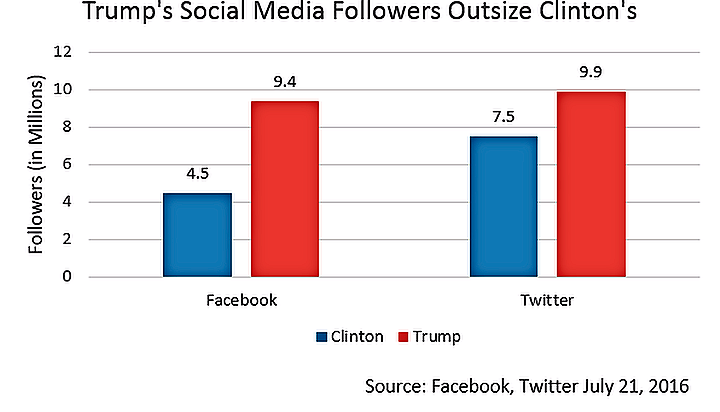 Clinton is more focused than Trump on translating that social media reach to real-world pull, said Daniel Kreiss, media professor at the University of North Carolina at Chapel Hill. Both candidates have continued to push the social media envelope during the two-week national convention stretch. Their campaigns are experimenting with Facebook Live video stream, new to the platform since the last presidential election, as well as chat features on YouTube and 360-degree arena views on convention apps. Clinton also sponsored Trump-mocking Snapchat filters that can overlay photos posted in downtown Cleveland, the site of the Republican convention. Clinton may be better at targeting social media users in the fall through Facebook ad campaigns, sponsored posts and promoted tweets, Kreiss said. Her campaign's database with information about potential voters, donors and volunteers – gathered from sources like door-to-door surveys and voter turnout history – is far more sophisticated than the Republicans' data infrastructure, he said. Clinton will be able to access much of former Democratic candidate Sen. Bernie Sanders’s database, and use the information in targeted social media ad campaigns to recruit more donors and volunteers to her team, provided she secures the Democratic nomination in Philadelphia next week, as expected, Kreiss said. That's because the Democratic Party's database structure is unified from the beginning of the primaries. Data collected from each candidate is separated by a firewall that is then removed after the party formally nominates a candidate. The Republican Party's voter database is more fragmented, and former primary opponents are asked to format and surrender their data to the winning candidate before the national conventions, he said. “The data architecture that the Democratic Party has put together will benefit Clinton’s social media operations,” Kreiss said. Trump has been dismissive of the use of data analytics for much of his campaign, and his Republican opponents from the primaries have been reluctant to share information they collected on potential supporters with him, Epstein and Usher said. The Trump and Clinton campaigns did not immediately respond to requests for comment.